The ABUS Granit Container Padlock is the industry standard container lock. 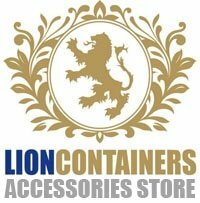 We have a wide range of container accessories available, for further information regarding cost and delivery, please contact us and a member of our team will be in touch. 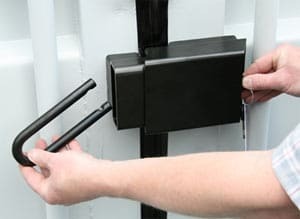 The ABUS Granit Container Padlock is a high security lock, which is designed to protect storage containers and facilities from theft, vandalism, corrosion. This lock is fitted by two solid bolts which goes in the inside of the high decurity lockbox. This padlock comes with a key that cannot be copied by standard lock smiths or key cutting machine but a specialised code card will be provided. When using this padlock, Lion Containers Ltd recommend having a high security lockbox fitted to the cargo doors, to increase the security. The lockbox is a steel shroud that sits between the cargo doors and the padlock is attached to a small lug inside.